SEN/D at St Thomas' includes children with special educational needs and disabilities. At St Thomas', we recognise our responsibility to nurture all our pupils whatever their individual needs, enabling them to achieve their full potential though an inclusive education. Effective scaffolding/differentiation is seen as the prime intervention in meeting pupils’ needs. When a child’s needs are significantly different from or additional to the rest of their peer group, they are recognised as having Special Educational Needs. When a child is identified as having additional needs they are helped in achieving their potential through the waves of intervention. Identifying, at an early age, individuals who need extra help and attention. Enabling each pupil to reach his or her full potential, both curricular and extracurricular enabling each pupil to partake in, and contribute fully, to school life. Endeavouring to meet the individual needs of each child. Developing a feeling of self-esteem within the individual. Fostering an atmosphere in our school which will promote a happy, sensitive and secure environment to ensure the most effective learning for all children. Providing for children’s individual needs by supporting them in various ways: whole class, small groups and individual. Monitoring closely those with SEN/D by review and assessment, to enable us to recognise, celebrate and record achievements. Providing access to and progression within the curriculum. Working with parents and other agencies to provide support and opportunities for those children with SEN/D. Using a variety of teaching strategies, which include different learning styles, to facilitate meaningful and effective learning for all children. Assisting all staff in the delivery of educational entitlement and ensuring all staff are aware of a child’s individual needs. Ensuring access to a range of resources to support staff in their teaching of children with SEN/D. Including the voice of the child in monitoring and reviewing one page profiles, IEP’s and Provision maps. Having regular contact with parents, encouraging them to be involved in their child’s learning. Enabling staff to provide for the additional needs of children through appropriate training, support and resources. The SEN governor is Mrs S Uddin. This document includes detail of the provision and intervention we can provide within school. It has more information about how we are able to support children in school with special education needs and disabilities. At St Thomas', we recognise that pupils at school with medical conditions should be properly supported so that they have full access to education, including school trips and physical education. Some children with medical conditions may be disabled and where this is the case the school will comply with its duties under the Equality Act 2010. Oldham’s Local Offer is an online resource that has information about local and national organisations and services. It also provides support and guidance to families with children and young people aged 0-25 with special educational needs and disabilities (SEND). POINT is Oldham’s established Parent Forum for parents and carers of children and young people aged 0-25 with additional needs, who live in or access services in Oldham. Their aim is to pro-actively represent families, ensuring that parents and carers have greater choice and control to meet their current needs and have a voice in shaping future services. The website is packed with information to support children or young people. They are determined that through their collaborations across Health, Education and Social Care, that together, they can improve the life chances and aspirations of children and young people with additional needs and disabilities. Family Information Service provide help, advice and support for parents and carers of children aged 0-20 years old. 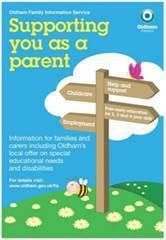 Parent's are encouraged to add their child/children to Oldham's additional needs and disability register. We review and update our services regularly to make sure they meet the needs of children and young people. To help us do this, we have a list of children and young people that includes information about how their special needs or disabilities affect their life. This gives us a wider picture of the support services we need to develop. You can help influence how we improve services by adding your name, or your child's name, to this register. It's entirely voluntary of course, and doesn't affect the services you get. Yes. The information is kept securely following the rules following the current GDPR guidance 2018. General information is shared with people who plan services, but they don't know the names of the children or young people. Personal information is limited to professionals already directly involved with your child and the register co-ordinator, and not given to anyone else without your permission. If you would like a paper copy of any information displayed on this page please contact the school office.